Our Grandville dentists are dedicated to providing patients with the highest level of dental care. This means learning how to use the latest dental laser technology to treat tooth decay, gum disease, and more. 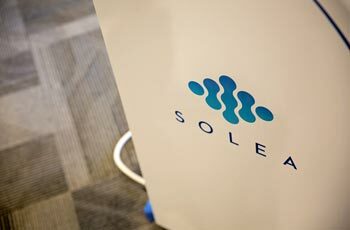 The Solea laser is currently the most advanced dental laser on the market and requires no anesthesia for the majority of dental treatments—great news for patients with needle phobias. The Solea dental laser features simple computer controls that give our Grandville dentists better precision during procedures. The laser is able to cut through hard, soft, and osseous (bone) tissue at faster speeds than ever before while remaining precise. Since the laser allows our dentists to cut through tissue faster, they are able to get more done in one visit. If you are uncomfortable with the sound of a dental drill, you may want to ask one of our dentists about our Solea laser for cavities. Unlike tooth drills, the Solea laser is nearly noiseless, which can help relieve anxiety. By using a dental laser, we are also able to greatly reduce bleeding and the need for sutures for gum treatments. Our dentists, Sarah Palmer DDS and Amy Harmon DDS are always looking for the next advancement in dental technology to improve patient experiences. If you are interested in learning more about the benefits of laser dentistry or about any of our dental treatments, give our dentists in Grandville a call at (616) 534-0080.